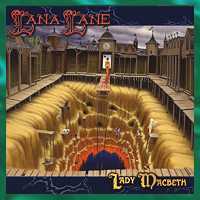 Lana Lane celebrates her 10th anniversary in the music business with Lady Macbeth, her 11th studio album. Originally from Concorde, California, Lana Lane made her debut in 1995 with Love Is An Illusion. In the years that followed, she earned the moniker, "Queen of symphonic rock," and Lady Macbeth ensures that she no doubt will retain that title. Musically, Lana Lane has played a combination of symphonic and progressive rock. There are facets of heavy metal, but these are mostly kept to the guitar riffs. The principal concern here is melody with an undercurrent of dense hardness. Yeah, this is epic rock and roll, and Lana Lane dips into the likes of King Crimson and Heart and forges them together. Guitarists Peer Verschuren, Mark McCrite, and Neil Citron set down some finger-numbing riffs, as well as some nice acoustic interludes (and mandolin on Shine On Golden Sun) and head swaying solos. Erik Norlander's keyboards tap into progressive and sweeping vistas, which push the sound more toward symphonic or rock-opera status. Bassist Kristoffer Gildenlow (Pain Of Salvation) makes his presence known on the bass, particularly on quieter tracks, such as No Tomorrow and Our Time Now. Drummer Ernst Van Ee is bombastic when necessary, subtle as needed; and backing vocalist Kelly Keeling complements Lana's thunderous vocals. Produced by husband Erik Norlander (Rocket Scientists), who also contributed lyrics and keyboards, Lady Macbeth is a concept album inspired by William Shakespeare's play. Like Marion Zimmer Bradley's novel Mists Of Avalon, which retells the Arthurian legend through its women, Lady Macbeth takes the point of view of the hardened but guilt-ridden matriarch who in many ways is responsible for the rise and fall of Macbeth. Lyrically, the album focuses on key parts of the play, rather than telling a strict narrative. The emphasis is on emotions, particularly Lady Macbeth's overwhelming guilt (captured in the poignant line, "If I could, I would," on the opening track, titled The Dream That Never Ends), her self-doubt but overriding ambition (flawlessly chronicled in Someone To Believe), and her hideous resolve (Summon The Devil). Both Norlander and Lane have outdone themselves in capturing the central themes of the play but concurrently creating their own unique approach. The lines borrowed from the Bard are minimal, but those that do make an appearance work effectively and do not detract from the narrative. My one quibble with this release is the brevity of the songs. Only the opening salvo, The Dream That Never Ends, and We Had The World, tap into the length favoured by progressive acts. I also would have liked to have heard more rockers like Summon The Devil and Keeper Of The Flame, although the mellowness of the overall album works well. Fans of Lana Lane and symphonic rock will not be disappointed, for Lady Macbeth retains everything such fans are accustomed to: solid production, flawless musicianship, a great storyline, and, of course, Lane's vocals, which remind me so much of Ann Wilson but are much more powerful. For those of you who have not heard of Lana Lane, this is good place to start.